Every production presents a unique set of challenges- and our recent shoot for Visit Florida was no different. 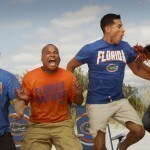 The concept for this commercial spot was fairly straight forward: capture the intensity and humor of NCAA football fanatics from all around the state of Florida. But the logistics and execution were a different beast. From the early stages of pre-production, we knew this concept had 2 prerequisites: (1) it needed to be captured in slow-motion and (2) the location had to be on a beach. Here are six steps to capturing better production audio. Every microphone has it’s own unique pickup patterns, and learning which to use in a given situation tends to separate the pros from the amateurs. For example, shotgun microphones, like the industry standard Sennheiser 416, are designed to focus their attention on a narrow area at the front of the mic while rejecting sound from the sides using interference tube technology. The overhead shot is a simple, yet powerful one. It’s a viewpoint the viewer rarely notices but they are able to gather so much information from it. It is also one of the most specialized shots to rig and requires some creative design if you have limited budget or limited space. SPARK Studios recently partnered with Junto Architecture for a video production project and we knew that overhead cinematography would help tie their story together and explain the precision required in their business.